This multimedia production pays tribute to some of the greatest music produced in the 1970′s and 1980′s. ABBA, originally from Sweden, swept the world with their music back in the 1970′s with songs such as “Waterloo”, “Fernando”, and “Dancing Queen”. 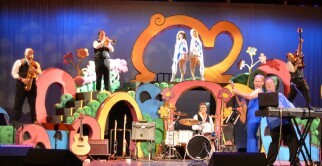 ABBA FAB is the closest recreation to an original ABBA concert as it gets. The stunningly accurate vocals of Anne Davies and Chelsea Faulds are complemented by an amazing 8 piece band led by Terry Davies.